Kitchen Window: On Hot Summer Days, Cook Your Fish Without Fire As much as a river-cold slice of watermelon is refreshing in the summer, there are sweltering days when you need a cold meal with a little more heft, a little more protein. On those days, there's raw fish. 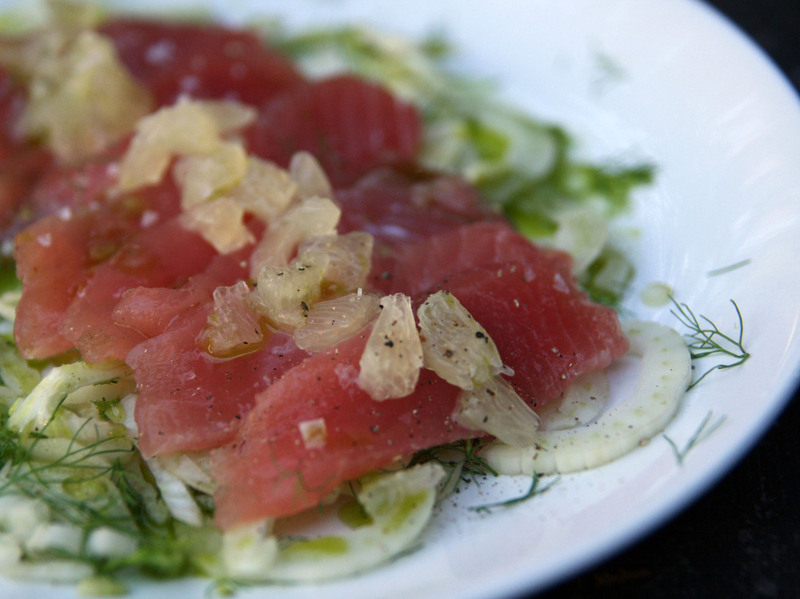 Get recipes for Italian-Style Crudo With Basil Oil, Fennel And Lemon, Avocado Ahi Poke and Cambodian Salmon Salad. There are the summer days where we bake cobbler and pie, and grill up slabs of eggplant and bushels of corn. And then there are the tropically hot summer days where the thought of turning on an oven — or even an outdoor barbecue — is enough to make you want to flop your sweaty self across the bed (or, better yet, into a pool of cold water). On those dog days, you don't want your food warm from the grill — you want it dripping with cold. But as much as I love a good corn-filled summer salad or river-cold slice of watermelon, there are those sweltering days where you need a cold meal with a little more heft, a little more protein. On those days, there's raw fish. This can be somewhat daunting. As someone who observed a fairly strict meat-free diet for over a decade, I tend to treat raw fish as something of a biohazard. I'm not alone — even the most adventurous cooks tend to feel that raw fish is a dish best left to the experts (preferably experts who have been required to pass food-safety certification exams). Also, beyond sushi, what would you actually make? Let's start with the food safety concerns. These fears are not without merit: Raw fish is quite capable of making you sick, both from bacterial spoilage of the fish itself as well as nasty parasites it may be harboring. The latter can be found in several varieties of fish, including almost all of those that spend their lives (or at least part of them) in fresh water. However, these parasites can be killed with blast-freezing to subzero temperatures, in those cases where you're not looking to slice up fish that's just been caught. As for spoilage, the same holds true as with any fish purchase — go with a fishmonger you trust, one with good selection, knowledgeable staff and high turnover. Unfortunately, the term "sushi grade" is not regulated, but states have generally interpreted that as meaning the fish is safe to eat raw, as laid out in health code guidelines. As for what you would make, there actually are a wealth of summer-friendly raw fish dishes from around the world, as well as some foolproof guidelines you can use to riff up your own creations. Some dishes, such as the South and Central American ceviche, lightly "cook" the fish in an acid such as lime juice. Others serve the fish straight up, with just a light touch of oil, acid and salt to bring out its pure flavors. There are Hawaiian poke recipes, which mix Pacific fish with a simple dressing of Asian flavors and pinch of seaweed. Peruvian tiradito blends Latino and Japanese influences, and Tahitian poisson cru bathes raw fish in coconut milk. It's also quite easy to freestyle a summer raw fish dish out of whatever ingredients you have on hand. The flavor profile can vary, but as long as you have top-quality fish, a bit of salt to bring out the flavor and a splash of acid to provide a punch of counterpoint, you'll end up with something delicious. And — just as important — nice and cool. 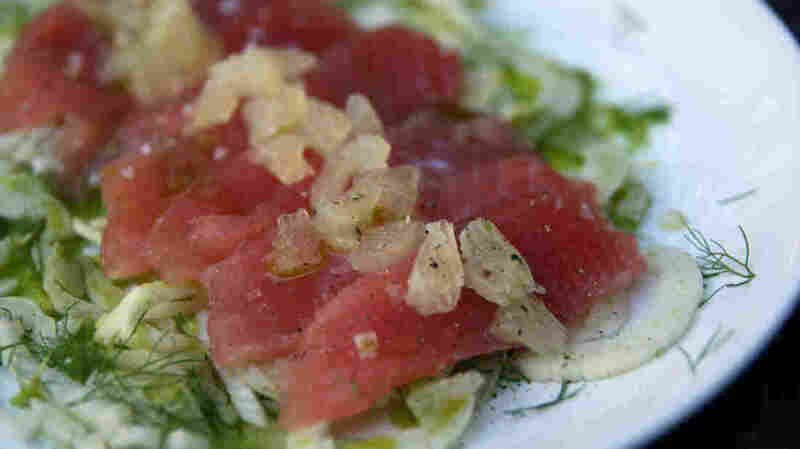 David Pasternack, at New York City's Esca, has been championing crudo, an Italian take on sashimi using just fish, olive oil (of course), salt, lemon and select accents. For my take on this tradition, I turned the olive oil into a basil oil (which requires some sitting time), laid the fish on a bed of thinly sliced fennel and used chopped lemon almost as a bright Italian salsa. Bring small pot of salted water to a boil, and have a strainer ready in the sink. Add the basil to the boiling water, letting cook for just half a minute or so, until the color darkens. Immediately pour into the strainer, then rinse with cold water to stop the cooking. Dry as best you can (using a salad spinner and/or dish towel), then transfer to a blender. Pour in enough olive oil to cover, then blitz until it looks like green oil. Let sit in a cool place for a few hours (overnight is fine too), then strain. Set aside (this can be done in advance). To serve, lay the fennel down on a serving plate, tucking in a few fronds here and there. Lay the fish down on the fennel and top with a sprinkling of the lemon. Pour the basil oil around the edges of the fennel, and over the top a bit as well if desired. Season with coarse salt and pepper and serve. 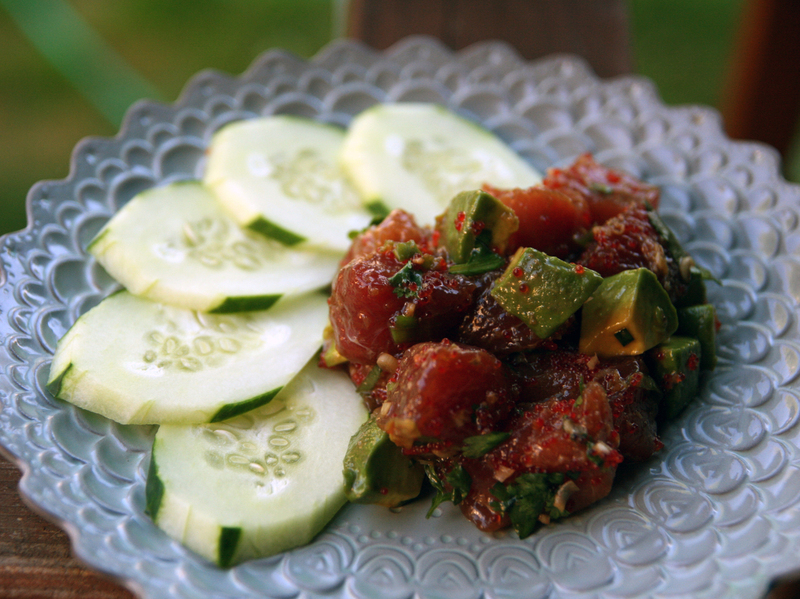 Poke comes from Hawaii, where the soy-dressed raw tuna is often enjoyed as a surf snack. Here the fish is tossed with buttery cubes of avocado, for a lighter summer take. In a medium-size bowl, whisk together the ginger, soy sauce, sesame oil, scallions and white pepper. Taste and adjust seasoning if desired. Stir in the tuna and tobiko or sesame seeds, then return to the refrigerator to marinate for half an hour. Gently stir in the avocado and cilantro and serve. 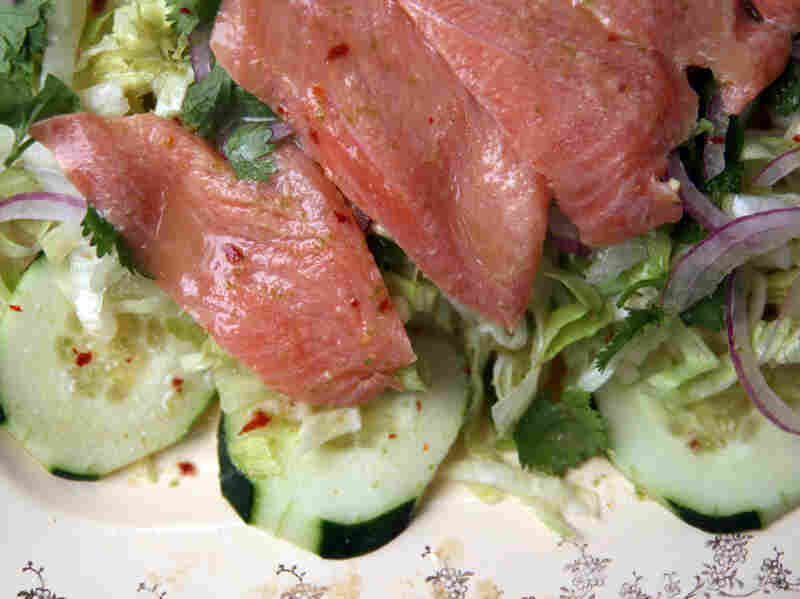 Dishes such as this are common in Southeast Asian cuisine, where a salty-sour marinade of lime juice and fish sauce is used to lightly (but not fully) cure the protein. This recipe is loosely adapted from Portland's Mekong Bistro, but the chef stressed that it can be freely adapted to suit your taste. Place the dressing ingredients in a blender, and puree until the garlic and chilies are broken down to bits and the sugar is dissolved. Taste, and adjust flavor balance to your palate. Place in a bowl and add the sliced salmon. Refrigerate for about 30 minutes, stirring once or twice to distribute marinade, until the fish has lightened in color but is still tender. While the fish is marinating, arrange the lettuce, cucumber, onion, lemongrass and herbs on a large serving platter. When the salmon is done marinating, place on top of the salad, pouring the additional dressing over the vegetables. Top with the green mango and serve.